Senate Majority Leader Harry Reid is out Monday with a harsh new attack ad. (CNN) - Senate Majority Leader Harry Reid is out Monday with a new ad that blatantly accuses his opponent of siding with domestic violence perpetrators over their victims. 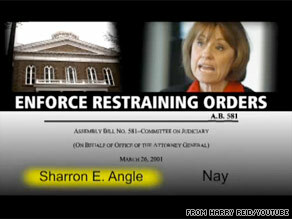 "In the state assembly, Sharron Angle voted to prevent restraining orders from other states from being enforced in Nevada," a Nevada Patrol officer says in the ad. "It would have made Nevada a safe-haven for domestic abusers. Thankfully, other legislators weren't so extreme, because Sharron Angle sided with the abuser, not the abused." The accusation refers to a vote Angle cast as a Nevada state assemblywoman in 2001 against a bill that would honor restraining orders issued in other states. The bill eventually passed 31 to 9. The 30-second spot began airing statewide on Monday, according to Reid's campaign. Angle's campaign accused the powerful Democrat of taking the former state assemblywoman's vote out of context. "It's taken out of context, she did not oppose the merits of the bill, she raised concerns to ensure that enforcement documents were authentic and present," Angle campaign spokesman Jarrod Agen told CNN. "Attacking Sharron, who's a grandmother and a former schoolteacher, on domestic violence is just desperation and more fear mongering to distract from Harry's failed economic record in Nevada." The high-profile race between Reid and Angle has grown increasingly bitter since Angle locked up the Republican Party's nomination in June. A Mason-Dixon poll conducted for the Las Vegas Review-Journal and 8NewsNow released Sunday reveals the race is in a statistical dead heat. Is there anything Reid won't say or do to get re-elected? This clown needs to go and please send Pelosi with him. Maybe her husband can put his big boy pants on and show her how it feels to be abused. If the polls don't consistently show little Harry with 50% of the vote by the end of the month he is toast. He played a large part in not only the job killing agenda for Nevada but the rest of the country. He needs to go. Scarry to think that anyone would vote for Sharon Angle. If that Angel woman wins then There must be some government agency that could be sent in to check for contaminants in the water. Why else would these people vote against their own interests for a loon that wants to get rid of SS, medicare, public schools (Only private religious schools should exist according to her) and calls people who cant find a job LAZY?? This weirdo think girls raped should be forced to carry the baby and see it as a test from god. She thinks somehow they deserve it because of their sins. Even if their own father rapes them. Its Disgusting! What an embarrassment. What is wrong with Nevadans? Seriously??? Reid is a slimeball slinging mud at everything he can! Look at his record Nevadans!! Look at your unemployment rate (among the highest of any State) Look at the smug,elitist way Reid rammed Obozocare down your throats, look at our Economy after 4 years of his Senate leadership! Vote this weasel into obscurity for the good of our Country!! Frankly speaking, I don't think Angle understands law or politics, she's kinda weak in the brain. Do you suppose old Harry might be just a bit desperate, and panicky? Sure loves to put words in other peoples' mouths, that they didn't say. Dirty harry is the one that threatened his spouse with harm if he loses in November, when he said that unemployed men are more likely to be violent. But harry doesn't know how to create jobs. Neither does Nanc, neither does Barry. Why oh why did my party end up with a witless wack job running – looks like Reid is going back to Washington – what a mess. Don't we have anything better than these 90 IQ nut cases? More lies and deciept by the now infamous KING OF LIES! Reid is a skunk and stinks to high heaven. he is the lowest form of life on the planet. This ad shows how desperate Reid has become. Hey it amazes me the way these repug thnk they can just say anything and get out of a situation, they really dont care much about the american interlect do they. well i dont blame them.Americans are probably the scariest people in the world, fox news knows this and have been playing with their emotion of fare ever since..When your a fareful people you can be easily manipulated to do stuff even against your own self interest. But i am still astonished for a people who claim tn be so interlectual advance their emotions cause them to be no more than a puppet on a string. If any body still listen to this nasty old man they're not well. I don't know why anyone would vote for this lady at all. Harry Reid is a desparate old man who will say anything to get reelected. What has happened to the once-proud Republican party? How in the world do they find and support candidates such as Ms. Angle. Each time she gives an interview she is more out-of-it than the last time. How can any intelligent person in Navada even consider voting for such a candidate? Reid is such a sad character. He was a puppet for the administration instead of representing the American people of his state, and when he finally gets strong, it is in lame personal attacks. Rethugs sure do like to use the word fear mongering. I guess when you champion something you should promote it or use huh?? angle is disturbing and so is Palin dingy rse. Sounds like its 'hit below the belt time'for Reid and the rest of the scumbag Obamacrats!Reid knows he's gonna be out of work very soon! She is a real real nut and I can not image her in the Senate. CNN, how is this an "attack", when Reid merely points out Angles outlandish comments and votes? Reid is running a clean campaign, he can't help it if Angles own words and actions portray her as an extreme nutcase.